I was so pleased when Ed chose scones as one of his Desert Island Dishes. 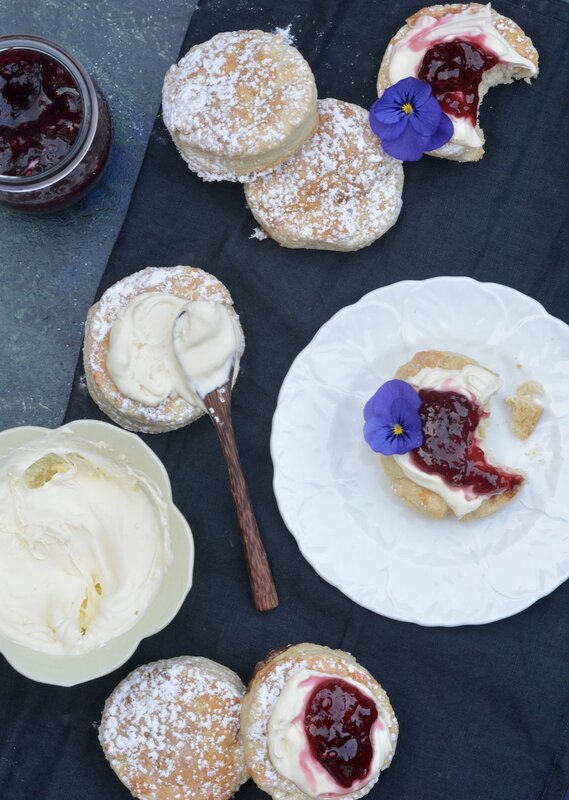 Scones are the quintessentially British tea time treat. Light, fluffy and with that magical melt-in-the-mouth quality that makes them so dangerous to those inclined to slightly overindulge at the tea table. They have that “oh-go-on” air about them that encourages, or rather more accurately, positively cajoles you into have “just one more”. But if you cant over indulge at tea time, when can you? Don’t get me wrong I love all aspects of an afternoon cream tea. I love the little sandwiches filled with thinly sliced cucumber and egg mayonnaise. Egg always on brown bread, while cucumber always on buttered white sliced bread. In both cases the crusts must have been cut off, but you probably knew that already. I eat crusts at every other time of the day but for some reason at tea time they are a no-no. I love cakes of all shapes and sizes served at tea – from gorgeous cream cheese frosted carrot cake, or a simpler un-iced coffee and walnut, or mini cupcakes piled high with buttercream or glazed with a drizzle of icing. I love them all. But a spread at tea time is not complete without some scones and luckily they are very quick to rustle up. Pile them high with clotted cream and lashings of jam. So simple and so good. So simple: that is unless you are unfortunate enough to adorn your scone with jam first in Devon before the cream, or heaven forbid you go to Cornwall and start spreading clotted cream all over your scone before you’ve got near the jam. There is etiquette to scone eating and it can divide even the closest of friends. I tend to try and avoid siding with either county and instead just try and ensure I get as much clotted cream on as possible. That is a priority. For me this normally means starting with the cream. I won’t dictate to you your course of action on this point and as always the choice is entirely yours. There are many scone recipes out there and most follow the simple method of rubbing together butter and flour and occasionally sugar and then binding the dough together with a little milk, or egg in some cases. Not so with this one. Because I am a firm believer that you can never have too much cream I make mine with no butter or milk and simply just go full steam ahead with cream. The result is rather counter intuitive as I think these are the lightest scones I’ve ever had, which I know sounds bizarre. But I promise. You wont get the highest rise out of these, so they won’t impress people with their stature but what they lack in the looks department they more than make up for with their taste. Rest assured, I have made these many times and can vouch for their deliciousness. These really couldn’t be easier to make, why not give them a go this weekend? Preheat the oven to 220c / 425f / Gas 7. Line a baking tray with greaseproof paper. Sift the flour into a bowl . This can seem like an unnecessary extra step but it really helps with the lightness of the scones. Add the pinch of salt and the sugar. Add about 200ml of the double cream and stir until you feel it come together. Add more cream if it needs a little more help binding together. Tip out onto a lightly floured work surface and knead very lightly. Over worked or over kneaded scones can happen very easily and they are as tough as old boots. Roll or push out until about 1 cm thick and use a 2 inch cutter to stamp out the scones. Any off cuts or trimmings can be gently smooshed back into a scone shape so that none of the dough goes to waste. Place on the baking sheet and brush each scone with a little egg yolk and a sprinkling of sugar. Bake for 6-8 minutes until they have risen slightly and gone a gorgeous colour. Enjoy hot from the oven with lots of clotted cream and jam, or they are perfect at room temperature too.